It’s been one of those weeks where time seems to compress itself together and you find yourself blinking and wondering where the days went. Which is not to imply a lack of fun. In fact, much fun was had, what with the celebrating of my brother’s birthday (Happy Birthday, Chase!) and the throwing of a Stella and Dot trunk show — both of which involved family, friends, laughter, and just the right amount of liquor. Well, I was reading Tooth and Claw by Jo Walton. However, there’s an entire page missing — just one whole page gone — near the beginning and it’s thrown me off a little bit. I keep trying to figure out how best to read the missing page, while deciding if I should just keep on reading even though my brain is screaming at me that there might be vital information within that page regarding plot of character. I’ve started redrafting my scoff retelling of Hansel and Gretel. Connecting to the tone I want for a story is a large part of my ability to actually finish a short story, and I seem to have the right tone now. So, I have hopes. A deadline to a writing market sprung itself on me last week. It was a today, what do you mean today, I haven’t written the thing moments. In the past, this has meant me just giving up on the idea of submitting to the market. But last week, I decided, hell no, I’m writing the thing. So, I wrote the poem in an afternoon and submitted it. I feel pretty good about it, too, although I’ll wait to pat myself on the back until I get a response from the publisher. “You don’t need more motivation. You don’t need to be inspired to action. You don’t need to read any more lists and posts about how you’re not doing enough,” writes Jamie Varon in her post to Anyone Who Thinks They’re Falling Behind In Life. A huge international study of gun control finds strong evidence that it actually works. Surprise, surprise. Spent a sunny Saturday at Boogie on the Bayou in Campbell with my Bestie, drinking several beers, eating giant sausages, shopping at the many booths, and getting sunburned. 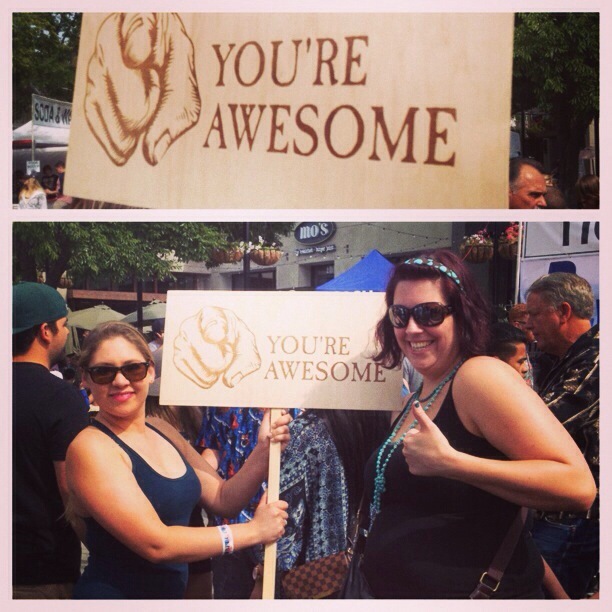 While out and about, we came across a rather awesome young woman, holding a “You are Awesome” sign. So, I had to take a picture. What I’m reading: Amal El-Mohtar posted a great essay on Reading Dialect in Celeste Rita Baker’s “Name Calling,” which lead to some interesting discussion. The reading and discussions lead me to actually reading Rita Baker’s rather fantastic story itself – posted first in the edited version (toning down the dialect) and second in the original version (with dialect as it was submitted). Other Thingies: I actually got off my bum, braved the heat, and went for a run this weekend, which felt fantastic. It’s going to be busy week as I prep for my trip. Not sure how much I’ll be able to accomplish beyond Get Ready for Trip, but here’s hoping. While scrolling through my blog cue today, I noticed two very good blogs that talk about why stories work and why they don’t. Both posts look at how to approach plotting, coming to similar, but slightly different conclusions. Each has me thinking about my current stories and how I approach them. Hopefully, you find them helpful as well. Lisa Cron’s post also have me think about how the idea of plot/story being problems can also help writers in another area — creating dynamic characters. Often characters will be seen as too being too passive in stories. However, characters are likely to be less passive, if they have a problem that requires them to act in order to resolve it. So, thinking of story as problem provides a solution two two writer dilemmas — plot and character — with one stone. Very cool. 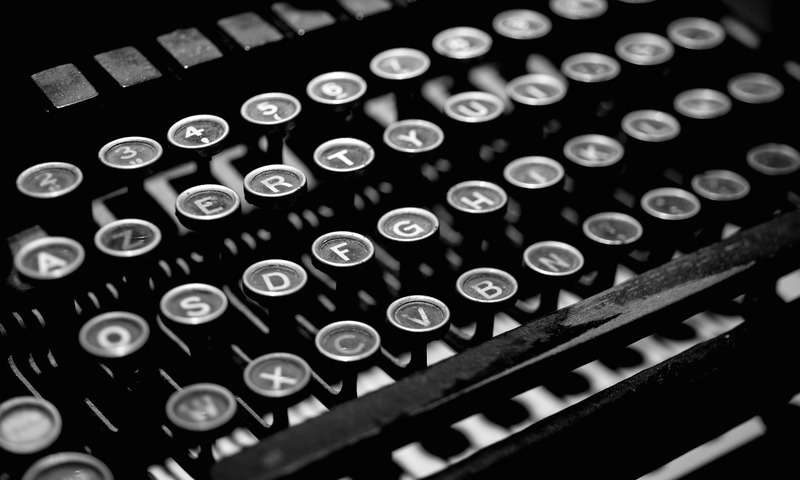 If you’re a writer, tell me what you’re writing these days? Did these articles help you? If you’re a reader, what are you reading? Is it well plotted, or does it fall flat in the way these articles describe? In October of this year, I traveled to Italy and along the way bought myself a $300 Italian leather jacket. It was a huge expense for me, more money than I probably should have spent. But the jacket was gorgeous and fit me perfectly and came with a wonderful little story, and I didn’t once feel any regret about the purchase. I came home and showed the jacket off and received positive responses from family and friends, assuring me that it was a great purchase. “It’ll last you forever,” several people said. Except that today, I discovered that I somehow managed to tear the jacket, a solid two-inch rip in an awkward place just above the right pocket — which just about breaks my heart. I know it’s just a thing, an object I don’t need to hold attachment to, but dammit, between the cost and how much I love wearing, it hurts. Apparently, there might be a shop near my office that does leather repair, so I’ll take it in and see what they can do to fix it. At the moment, though, I’m just taking deep breaths and trying not to loose my sh!t. Fortunately, for everyone, there is this story to make everything all better. Miles Scott, a 5 year old boy who’s fighting leukemia, just wanted to be a superhero, specifically, he wanted to be Batman. So, Make-A-Wish Foundation worked to put together a special event, turning San Francisco into Gotham City for a day. Miles as Batkid and accompanied by Batman, was driven through in a “bat-mobile” and was able to partake in a series of death defying rescues, while thousands of people cheered. The miniature hero got ot help nab arch-villains Riddler and the Penguin and save a damsel in distress tied to the city’s famous tram tracks. The internet exploded with glee at the event, and every Batman, from Adam West to Christian Bale congratulated Miles on his heroism.